Months later when I had saw an ad in the Horse Trader about becoming a Acuscope/Myscope Therapist, I jumped at the chance of becoming one. Not only could I help Sweet Pea with this wonderful instrument, I could help other animals as well. All though Sweet Pea gets around very well most of the time (jumping, running, swimming and playing with her two Lab friends), she still gets sore. With the Acuscope I can administer weekly treatments, which gets her back on track. It has now been 5 months that I have been treating her weekly and you would never now this little dog has a plastic hip! There are times when she plays a little too rough with her buds and I can always tell!! While treating her, I may come across a spot with some inflammation which is indicated in high numbers with the Acuscope. When that happens I formulate my treatments according to the degree of pain and inflammation. Without Acuscope treatments, I know Sweet Pea wouldn't be the happy, active dog she is today! I just want to take a moment of your time to thank you for the work that you did on Jake and Dusty. The work you did was nothing short of a miracle. We are so impressed with the results that we would like to have you schedule a follow up treatment when you have an opening. The Dynamite products that you suggested have made a dramatic difference in both horses. Dusty’s feet are already softening up to the point that he moves around a lot better. Jake is another story - he feels so good that he thinks he is a stallion. His coat has a shine and texture that I have never seen on him before and his energy level is unbeatable. Once I get all of his muscles toned up again he will be a force to be reckoned with in any arena. Once again, THANK YOU! You brought back the pleasure of riding to our lives by way of Jake and Dusty. They may not be million dollar horses in some peoples’ eyes, but they are to us, and we wouldn't give them up for any amount of money. I had owned my expensive rodeo barrel horse for about 6 months when he got sore, quit running and definitely quit working. He started running off on the second barrel, which was very out of character for him. 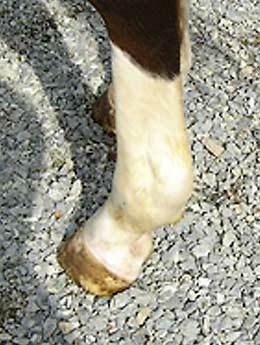 My veterinarian did a lameness work up on him, and determined that it was a hock problem. Since I did not wish to inject his hocks unless it was absolutely necessary, my veterinarian recommended that I bring him to you so that you could treat his hocks with the Electro-Acuscope/Myopulse Therapy System. Upon bringing my horse to you, the first thing that you did was a full body evaluation in which you took readings with the Acuscope all over his body to determine areas of abnormal conductivity. Of course his hocks read low, and to my surprise, his entire left front foot also had abnormal readings. I took the information that you had gathered back to my veterinarian, we took radiographs of that foot and discovered that my gelding also had a fractured coffin (pedal) bone! He had not shown any lameness in that area that I could recall, so you can imagine how shocked we were. My veterinarian said that it would take at least 6 months to heal, if it did at all. He wasn’t sure that my horse could ever even be used as a barrel horse again. At that point, I brought my horse back to you, and you started him on a rehabilitation program that consisted of Electro-Acuscope & Myopulse treatments, and a full line of Dynamite nutritional supplements that are mineral-based and supported his healing process. The results were miraculous! Needless to say, in 2 ½ months he was completely rehabilitated. My veterinarian went over him with a fine-tooth comb and couldn’t find a problem AT ALL! I have since started barrel racing him again and we are winning almost everywhere we compete. 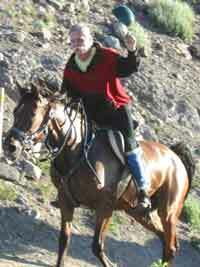 Thank you from the bottom of my heart Joyce – you gave my horse back to me! The day after we returned from taking your class in California, the first thing that we noticed was that you were so right in saying that we would never look at a horse the same way again. No kidding! You were an excellent teacher – you were wonderful! Thank you! Have had us all (me, dogs, horses) on the Dynamite products for 10 days now and am definitely noticing some changes. The tooth infection that I had while I was at your place has seemed to put itself on hold (according to my dentist that I saw again today). My dog with the chronic colitis is doing much better – her stools are definitely firmer and I have cleaned up her diet like you suggested. The horses love their supplements and my mare with the hormone problems is becoming very “lady-like”. I’m sure you have had students as excited and enthused as us, but I’ll bet that you’ve never had any more thankful! Our heartfelt thanks again Joyce – you should be adding patient and gracious to your business card!